It only takes one glance at the contenders to replace retiring Supreme Court Justice Anthony Kennedy to know that the outlook for LGBTQ rights on the Court is bleak. The choices that President Trump is considering differ only by the degree of their awfulness. The new justice has the potential to shape the direction of the Court for a generation. In many ways, a reshaped Court will be Trump’s longest-lasting and most damaging legacy. Give credit where credit is due: it’s all because of the religious right. For decades, the religious right has dreamed of the day when they had a Supreme Court with the same evangelical viewpoint as its own. The primary focus was always on overturning Roe v. Wade, the decision that legalized abortion, but pushing back on LGBTQ rights has run a close second. The turning point of Trump’s presidential campaign was when he released the list of candidates he would consider for a Supreme Court vacancy. As hard as it is to imagine now, at the time there were still lingering doubts as to whether Trump was really a hard-core conservative. To prove that he would be the ideologue that the right wing wanted, Trump used the potential of a Supreme Court vacancy to prove his bona fides. The list, by the conservative Federalist Society, was compiled based on a litmus test of conservative issues. That Trump was willing to pick from that list was all the proof that the religious right wanted. Releasing the list was an unusual move, but a politically savvy one. Religious right leaders credit that move as solidifying evangelical support for Trump. “He made it very clear who his Supreme Court picks would be if he was elected,” Jerry Falwell Jr. said after the election. “I think that was a big factor” in Trump’s victory. The prospect of finally controlling the Court was of particular help when Trump was caught on tape celebrating his affinity for sexual assault. With just weeks to go to Election Day, the revelation could have led to the collapse of his support. Instead, white evangelicals stood by him. In fact, the religious right leaders who condemned Trump hurt their careers. Neil Gorsuch was the first payback for that support. The second nominee will only cement the evangelical base’s love of the president. 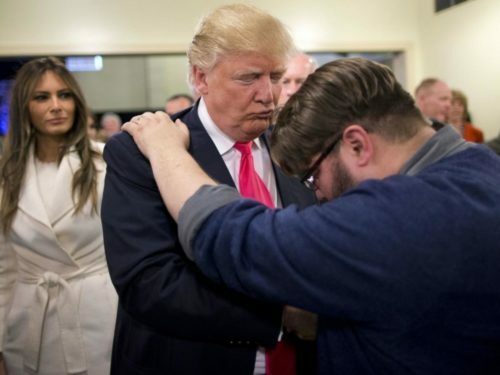 There’s a lot to be said about the gobsmacking hypocrisy of evangelical support for Trump, who displays all the Christian virtues of an old-style Communist ruler. But all the religious right cares about is the ends, not the means. They will never abandon Trump now. If anything, they will double down in 2020, hoping to create an even greater majority on the Supreme Court. They know what’s at stake. Let’s hope progressives know it too.